Web content writers create content that is published online. Their work may include articles, blog posts, product reviews, book reviews, website content and more. The type of work they do is based on client or employer needs and their own expertise and interests. Some people pursue content writing as a full time career or small business, while others do this kind of work part-time or as a side job. Web content writing is both similar to and different from writing for print publications. Writing skills are, of course, key for web content writers. Additionally, as a Yahoo! Small Business article points out, web content writers have to have strong research and editing skills. These skills are just as important for writers who create work for print publications as for those who create web content. 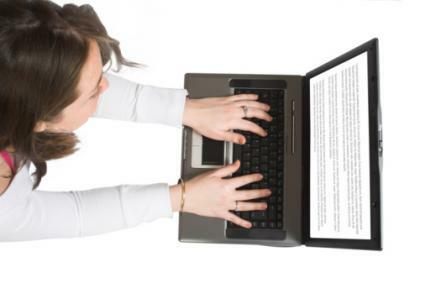 Writing skills are critical for web content writers. Most web content writing is informative rather than being creative writing. Some follows a journalistic style while some is more how-to in nature, focused on giving readers instructions they can follow to complete a task or project. Research may involve things like searching published literature (online and off) to develop a thorough understanding of the topic, interviewing experts or conducting reviews of products so you can share your experience with readers. Editing involves ensuring that your work is publication-ready when you submit it. This involves reviewing what you have written to verify that it is accurate, clear, well-written and free of grammatical or typographical editors. In addition to being able to write, research and edit, web content writers must also be mindful of creating content that will perform well in search results and look good when published online. With that in mind, Yahoo! Small Business indicates that people who do this kind of work must have an eye for design and knowledge of search engine optimization (SEO). It may also be necessary to work with a content management system (CMS). Design involves organizing content so that it will be visually appealing to readers. This involves breaking content into chunks organized under meaningful headings so that it's easy for readers to skim the content, using bulleted or numbered lists to call out specific points or steps and sourcing or suggesting images to illustrate the content. Search engine optimization involves creating content that will show up high in search engine results, which is a function of writing quality content that meets reader needs and that does not have excessive keywords or otherwise come across as spammy. Working with a CMS involves inputting content directly into a web-based user interface, something that content writers who work for online publishing companies will have to be able to do. Those who write content for websites may also need to enter their work via a CMS. Many content writers work as freelancers, though some are employed by companies that either need a significant amount of content or that provide content production services for other businesses. According to Payscale.com, as of December of 2014, content writers typically earn between $11.45 and $37.50 per hour, with total pay for full-time content writers falling between $25,334 and $63,451 annually. It is definitely possible to make a living as a web content writer, though contrary to what is suggested by some freelance writing scams, this is not a path to getting rich quickly without doing any work. You can earn a dependable income writing web content, but you have to be good at what you do, spend time searching for writing opportunities (at least until you secure steady work), meet your obligations and be willing to invest time, energy and effort into producing high quality work that clients or companies will want to pay you for doing. In other words, the requirements for succeeding in this field are no different than any other. If you want to make a living - or even earn extra money - as a web content writer, you will need to build a portfolio that highlights your ability to do this kind of writing and invest time in looking for work opportunities. There are a number of good places to look for online writing jobs for beginners, some of which are with revenue-sharing sites that do not offer up-front payments for writing, instead paying commission based on page views or advertising revenue. While the jobs you get at first may not be the best-paying opportunities, if you do a good job you may find that you are able to secure higher-paying gigs or even be considered for a full-time job in this field.